My mother receives a mysterious Halloween card every year without fail. 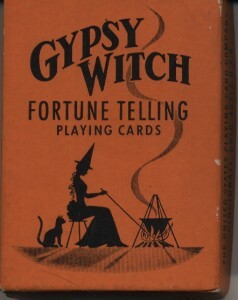 The card, usually unsigned, always features some sort of witch on in it. The sender is a long lost friend of my mother’s – someone she has not seen or heard from in years – save for this little tradition. As legend has it, my mother and this woman were friends back in the day and were colleagues in various social and charitable groups around our town. One year, as part of some fund raising event, my mother dressed as witch, complete with green make-up, and staffed a booth where she told fortunes for a small donation to the cause. The details of the ensuing exchange are pretty much lost to history, but basically whatever my mother told the woman based on the cards, spook her so much that she walked away stunned. She apparently told everyone she could that she thought my mother really was a witch because the reading of the cards was spot on. I think the lady was more or less joking about thinking my mother was a witch, but I also think that she believed there was something mystical about it all. Anyway, the witch incident became a thing between the woman and my mother that lasted for the remainder of their friendship until they drifted apart to the point where they are just long lost acquaintances. All except for the card that comes once a year at Halloween. Why do I bring this up now? Well, recently I was going through one of the many boxes of stuff from my parents’ house that are now in my custody and I came across the original tarot cards my mother used all those years ago. I knew them instantly and remembered the story about the witch and the old friend. I am going to keep these cards in a safe place, perhaps with all of my Halloween decorations, and bring them out every year and think about all the little things we can all do to surprise and delight old friends. By now you are probably tired of hearing stories about my mother. But this blog, in many ways, was inspired by her, so if you have to put up with it from time to time. I have talked in the past about my mother’s love for sewing collectibles (most notably buttons) and the like. The reason she was so into these things is that she loved to sew. When I was growing up, she made most of the clothes she wore, and much of the clothes we kids wore – although much more for my sister who loved the idea of having one-of-a-kind outfits for school. My mother could make anything, and she did. She could take any pattern and customize it into something unique. Or if she saw something she liked in a magazine she could design her own pattern and make something similar but likely better. Much of what my mom made for me when I was younger were things like pajamas and bathrobes, leaving the school clothes to the Sears Put-On shop. But there was one major exception… costumes! My mother also made exquisite costumer for herself, including an amazing Snow White outfit which people still talk about. But most legendary in our family were the Batman and Robin costumes my mother made for my brothers. I was too young to have any firsthand memories of this, but back when the hokey television show was all the rage, my mother made a Batman (ala Adam West) costume for my oldest brother and a Robin costume for my other older brother. Apparently the costumes were a huge hit. To the point that my brothers wore the costumes all day every day – at least when they could get away with it. And when they couldn’t go full tilt, my brothers would sport the utility belts, gloves or capes. It is so funny, there are pictures of my oldest brother like on Easter morning in his finest clothes and you can see underneath a flash of yellow – the Batman utility belt my mother made as part of the costume. 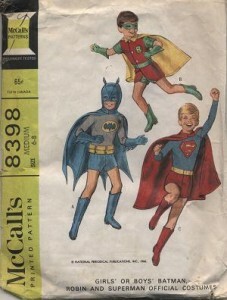 These costumes ended up in a big box with all sorts of other dress-up items I used to play with as a kid and I myself often ran around with the hand-me-down cape and mask. So it was with a ton of nostalgia that I pulled out the original pattern my mother used to make those costumes some 40+ years ago. I was struck by the fact that she kept it and all the pieces to it all these years. Another mid-century artifact found again for a new generation. While on a visit to our favorite stationers, Jules Besch of Wellfleet, MA, Sophie and I spent hours looking at all the amazing cards that the proprietor had collected for sale and falling in love all over again with cards and stationary. A trip to Jules Besch is always a thrill, but on this visit, over the Columbus Day weekend, Sophie and I had the opportunity to attend their annual tea event, when the Christmas card collections for the year are introduced in an open house format, including homemade treats, like raspberry cookies (Sophie’s favorite) and bourbon balls (more bourbon please!). It was on this trip that I stumbled across this great card from Le Clair Handcrafted Cards of Seattle. 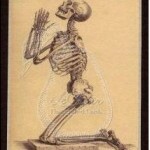 The card features a praying skeleton and I loved it. Although not technically a Halloween card, I purchased it as a centerpiece of my Halloween collection. I was curious to learn more about Le Clair and went straight to their website, where I found this card as well as dozens of other great cards. I love many of the card Le Clair offers, but for now – check out the series of Halloween themed cards here. The scariest movie I ever saw was this cheesy 70’s horror flick call “Burnt Offerings” – kind of haunted house psychological drama that still creeps me out to this day just thinking about it. I can still recall images from the movie and cringe. I also remember watching the TV mini-series based on Stephen King’s book “Salem ’s Lot ” and being really scared. I think were I to see it today I would laugh at it – but at the time it was pretty creepy especially for TV. And there was the “Exorcist” – the first movie I remember ever seeing on HBO and, well, it’s a cliché but I was scared silly. Like many people, I think of scary movies at Halloween. I am really not a fan of the slasher films that people have come to think of as the modern horror film, nor am I a fan of monster movies per se. I am one of those that like the atmospheric slow burn of a horror film. In recent years I thought “The Others” with Nichole Kidman was pretty creepy. But I have to say my all time favorite is “Whatever Happened to Baby Jane.” I love everything about this film from its crisp black and white cinematography to the iconic late career turns by its two stars, Bette Davis and Joan Crawford. Although much more of a psychological study than horror film, Baby Jane is scary in many ways as it shows the sadness that comes from a life of mental illness and betrayal. It is just so good. 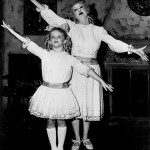 And Bette Davis, who had already had an amazing career, is brilliant in this role where she really gave it her all. So, yeah, I think I just decided, I am going to make myself a tray of pork chops and watch “Whatever Happened to Baby Jane” as my Halloween treat this year. Amazon has a nice 2-disc special edition DVD of Baby Jane on sale for just $14.49. Ok, this may not be technically a Halloween item, but it is a mask and it could be a costume if you really wanted it to be: the Walrus Ski Mask from Urban Outfitters. I have to admit that the idea of wearing a ski mask as a costume brought me back to some of the Halloweens of my youth – especially the ones in New Hampshire where it has been known to snow in October. It used to upset me so much when – after spending weeks perfecting my costume – my mother would make me wear a snorkel coat over my costume because it was so cold. Ah, those precious childhood memories. Find more fun stuff at Urban Outfitters’ Halloween Shop here. HALLOWEEN QUICKIE: Costumes for cats? I am generally not a fan of dressing pets up in costumes. Most of the time I find that the animals are uncomfortable and/or embarrassed as a result. However, I know that my parents’ dog Lady, the most precious puppy that ever roamed the face of the earth, used to love wearing fancy holiday-themed bandanas and the occasional t-shirt. It is inevitable that in the days leading up to Halloween you start to see people forcing their dogs into costumes. But I had never thought about dressing up cats. I have two cats, who as fate would have it were born on Halloween in 2000, and I would never think about dressing them up. However, I came across this cowboy costume designed for cats – it caught my eye for a few reasons. 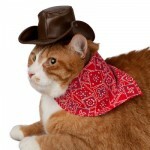 First, I was surprised there was actually a cowboy costume made for cats. Second, I was amazed that any cat would stand for it. Finally, I am convinced the picture of the cat in the costume was doctored. I love the way the costume is described on the PetsMart website: “Yee-haw! This Cowboy Costume from Pet Halloween is sure to kick up some dust!” I am sure if I tried to put my precious little angles in this costume more than dust would be kicked. But you have to love the little cowboy hat. Find this and other costumes for cats on PetSmart.com. This is so cool – at least the concept if not the execution – a “Psycho Shower Curtain” – the perfect Halloween decoration for your bathroom. The Psycho Shower Curtain, suggesting the classic scene from the Hitchcock film, is one of the many Halloween-themed items available on the Kirkkerlandshop website. Check out all the products offered by Kirkkerlandshop here. 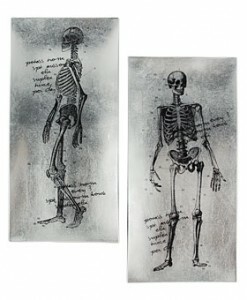 You have to love these Glass Skeleton Serving Platters available from Plasticland. Check out all the cool products offered by Plasticland here. I get accused of getting on topics and not letting them go, and I am afraid I am on a mustard kick these days. Maybe it is all the pretzels I have been eating lately, but I have mustard on the mind. 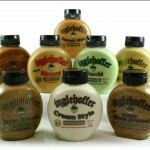 I particular like the Inglehoffer Brand Mustards, from Beaverton Foods. They make a full line of mustards — Dijon, Honey, etc– as well as Horseradishes, Tartar, Cocktail Sauce and more. Trust me, add any of these to a sandwich and you won’t be sorry. Check out the products of Beaverton Foods here. 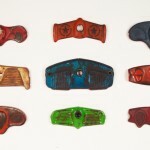 Well, we find all sorts of things that fit a certain “Lost Cowboy” aesthetic that we have not quite figured out yet – but when found the collections of Lost Found Art, we knew this was right in our wheelhouse. Find what’s on display at Lost Found Art here. Lost Cowboy is powered by	WordPress 5.0.4 and delivered to you in 0.901 seconds using 58 queries.